The location was at a great grocery in Silver Spring, Maryland. The "Take it!" came from my search for a photo that would be appropriate for the Whutzzat banner and the business cards for the Fall season that is upon us. The small pumpkins used for this purpose last year were so much fun and popular that I thought I might be lucky enough to find something similar for this year. A quick visit to a local produce stand and the aforementioned grocery provided more than enough. The After Take: All of the review group that I often turn to gave their happy approval. Each of us had one or more samples of the collection shown that we had never seen before. All of liked the colors, shapes and of course, that they had all been collected together for this great presentation. 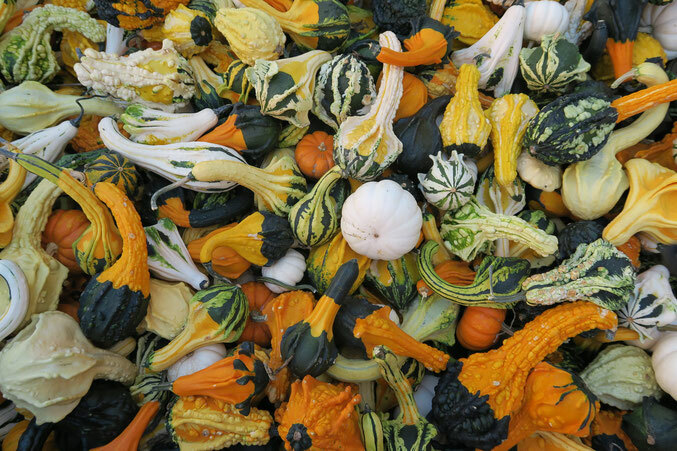 Here is hoping you have one, if not several places that offer you gourd extravaganza. Looking forward to all that Fall provides us. PS: I was second in line to take the chosen photograph. What a beautiful picture, so colorful! I'd almost feel guilty buying those to consume. Its too pretty a picture. This is really cool, just a blast of color. I can only imagine how cool of a business card this must have made. I think this has to be one of the most colorful photographs youve ever shared with us. This is gorgeous, the beauty that nature provides is often beyond words. I think this may be one of those times. This would make a great windows background. You should send this to Microsoft.